Raised in South Carolina, Ringer led a typical kid’s life until she sat in on a friend’s ballet class, an experience that would change her life forever. By the age of twelve she was enrolled at the elite Washington School of Ballet and soon moved to the School of American Ballet. At sixteen she was a professional dancer at the New York City Ballet in Manhattan, home of the legendary George Balanchine and Jerome Robbins. Ringer takes us inside the dancer’s world, detailing a typical day, performance preparation, and the extraordinary pressures that these athletes face. 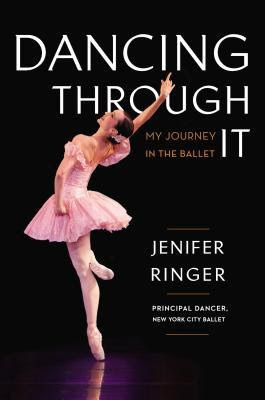 Ringer shares exhilarating stories of starring in Balanchine productions, working with the famous Peter Martins, and of meeting her husband and falling in love at the New York City Ballet. Ringer also talks candidly of Alistair Macauley’s stinging critique of her weight in his 2010 New York Times review of The Nutcracker that ignited a public dialogue about ballet and weight. She unflinchingly describes her personal struggles with eating disorders and body image, and shares how her faith helped her to heal and triumph over these challenges. As you'll see in my little about me, I've been a dancer for longer than I haven't been in my short teenage life. So besides the incredible story and writing, this book really struck a chord with me. Jenifer walks you through the humble beginnings of every little girl who puts on pink tights, through the moving around, progressing in the dance school, apprenticing in the company and climbing the ranks. You go through the amazing times and the rough ones, and she never once glorifies herself. Honestly, you have to keep reminding yourself that no matter how humbly she says it, she must be amazing to have been chosen time and time again over the others. I can tell you that on a much smaller scale, I related to her SO MUCH. I'm telling you this not only because it is a must read for every dancer, but to tell you how REAL and unexaggerated this was. The insanity and excitement that goes on behind stage, how dance can potentially and probably will consume your life when you're not on guard. How you develop perfectionism, and how your view of yourself physically and self-esteem change as you dance more. Truly, read this book! It is a coming of age story, as well as the story of a courageous and talented young woman overcomes the obstacles society and then eventually herself have put in her way. There were themes of health and happiness that I think anyone can relate to. I was hooked. I will warn you though- Jenifer is a Christian and it is her religion she credits her success to. Her faith is a thing of importance and a running theme in her book, but as a religious non-Christian I can assure you it was not messianic in any way or a bother at all.